During my two weeks on Fair Isle, I was volunteering at the Bird Observatory bar. This meant that I could cover my accommodation costs by working in the evenings and go birding during the day. It was very enjoyable and worked out well. I was able to chat to those stopping at the Fair Isle Bird Observatory (FIBO) and Islanders, meaning I learnt even more about the island community and how the island functions. Not only this, but it meant that I didn’t miss any birding during the day, or at night. 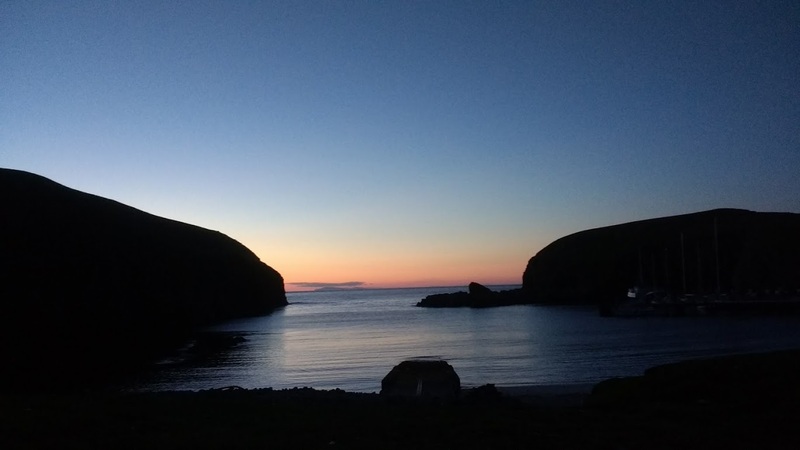 On three different occasions, after my shift had finished, at 12 midnight I made my way down to South Harbour and the boat house to watch and experience storm petrels being rung. This was a superb experience for myself, mainly because I’d never seen a storm petrel before. However, I had seen many photographs and heard plenty of stories about how much of a fantastic bird they are. Standing outside at 1am in the morning, especially in such a remote location, you would expect it to be pitch black. In fact, it was almost light and felt more like sunrise. With a pink sky in the distance and the faint, washed out silhouette of Shetland. The process of catching and ringing storm petrels included setting up mist nets in the shape of an ‘L’ then placing a speaker in the centre, which played the call of a storm petrel. Only one or two ringers sat close to the net whilst others (non-ringers and ringers) stood further back to avoid any overcrowding and so that the birds weren’t discouraged from the area. Once a bird flew into the net, it was quickly extracted and taken to ringers in the boat house who recorded measurements and rung the bird before it was released again. 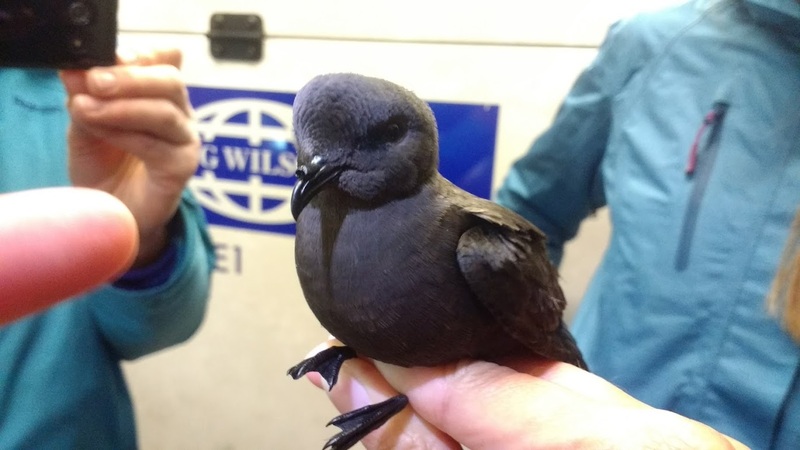 The storm petrels that were caught were European Storm Petrels, which are the most common petrel species to the UK. 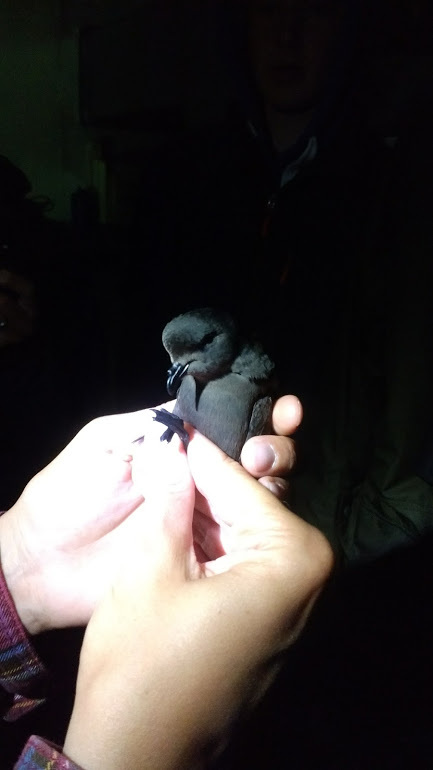 However, at Fair Isle, they have recorded rarer species including Leach’s Storm Petrels and in the last few years, Swinhoe’s Petrel, which have only been recorded a hand full of times in the UK. On my first evening, I stood well back from the nets with a group of others who were also keen to see a stormie. We attempted to focus our eyes on the nets to distinguish when a bird flew in, despite it not being pitch black, the nets (known as mist nets) can be difficult to see. However, it was obvious when a bird had entered the net as one of the ringers, those sat by the net, would suddenly run over to the bird. It was almost like watching a tennis match, but instead of the ball boys/girls retrieving tennis balls, they were retrieving storm petrels! When the first bird was brought into the boat house to be rung, I almost couldn’t contain myself! The ringer held the petrel in a cloth bag, which I could see slightly moving as the bird inside wriggled about. In the bag, was my first storm petrel! As they brought the bird out of the bag, I had to bite down on my hand to prevent myself from making a noise so that I didn’t frighten the bird, but I was so excited! It was a bit smaller then I imagined, but the first thing I noticed was the smell. An incredibly distinctive smell which I wish I could capture and describe in some way. It was an almost pleasant scent though. By the end of the night, after letting a few birds go from the palms of my hands, my hands stunk of them! I really didn’t want to wash my hands. It just reminded me of how exciting the evening was and how much of a superb bird they are! Stormies are hardy little things that spend most of their life out at sea in all kinds of conditions. Which is hard to believe when you see how delicate they look. Two of the birds I saw in the hand were in fact missing feet. This is due to them skimming their feet along the surface of the sea to collect one of their staple foods, plankton. However, this can prove dangerous, as sometimes a predatory fish may just take a nibble. Nonetheless, such deformities don’t seem to affect the bird’s chances. Spending most of their lives at sea, you can’t help but look at them in awe and wonder what they’ve seen and experienced. Thus, they have a great deal of character. The smell was definitely the best, along with the little bit of chattering they did whilst being handled. It is possible that Stormies can locate each other by smell whilst at sea. There have, in fact, been some dubious, controlled indoor experiments done of Leach’s to test whether, in make-shift mazes, they head towards the smell of their mate more than towards either no smell at all or other smells. It turns out, they head towards the smell of their mate. As they return to their nests during the night when it is likely pitch black, their use of smell is obviously important. They are incredible birds, and I really enjoyed learning about them from those at the observatory.